Long before the unfortunate Bradley Manning disclosed US government information, Katherine Gun who worked at GCHQ -- the main center of Echelon eavesdropping in the UK -- was alleged to have leaked a memo that she claimed exposed serious wrongdoing by the US and could have helped to prevent the deaths of Iraqis and British forces in an "illegal war." While Gun leaked an email, other leaks have been tracked (before and since) by identification marks within printed documents. The PDF is a common form of circulating information in many circles (not just government departments). It usually cannot be altered, unlike other document formats. Digital watermarking, however, can only be effected by using expensive software. We are used to the idea of watermarking images, particularly those that go online, but the PDF watermark needs a different approach. Ever since the advent of OS X, it has been possible to print a PDF from almost any application, but this is limited if security or copying is a concern. Not all of us can afford the expensive software required, although the idea of being able to identify a document (apart from its contents) is attractive, in terms of commercial security, where the early leak of information, could cost a company heavily. 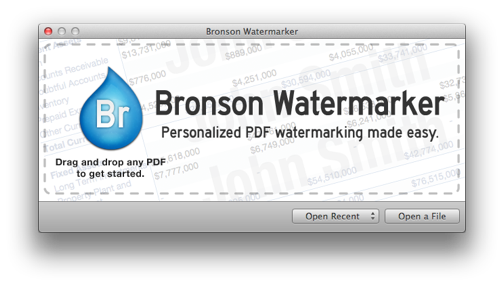 A new application available in the Mac App Store, Bronson Watermarker, is a reasonably priced solution to the watermarking problem with a couple of attractive features, but one or two shortcomings. John August, who is listed in the credits on the Developer site for the design of Bronson Watermarker, needed to be able to put 40 different names on a screenplay but the only way to do this was to create 40 different PDFs. The difficulty of what should be an easy task was explained to Nima Yousefi who ended up creating Bronson. Like some of the best applications, this has one main task, it does that easily and it does it well. The opening interface is so clear that there were no difficulties in getting started. 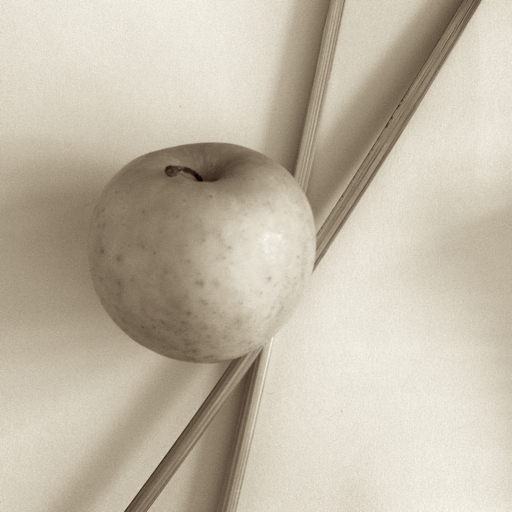 I was offered three options: dropping a file on the main panel, opening an existing file, or opening a recent project. Using the "Existing File" button, I accessed a PDF that I created for Lion System Preferences that has already been downloaded a number of times. This is some 131 pages and has scores of images embedded, giving me a file of 17.8MB. The file was opened in large panel. To the left is the Watermark Text dialogue panel that tells us, "Each line will generate a unique PDF". I entered my name in the first line and pressed the Enter key, moving to the next text window. We may also use the + icon below to add a new line (and - to remove). There is also a Clear All button to start again. Below the text panel is a button for Watermark Style. There are 4 available: Center, which puts the text in the center of the panel; Triple which puts a centered text at top, middle and bottom of the page; Diagonal, which places a diagonal watermark page center; and Diagonal Outline. In some cases, where several words/characters are used, Center will create a second line, which is not unattractive. However, Diagonal tends to lose some of the bottom of the second line, suggesting that a font size control might be useful. Diagonal is the only change to font style and as the name suggests, creates a slightly bolder black-outlined text. Below the Style button is a check-box marked Deep Burn. The information on the FAQ tells us that this makes each page a JPG image and that this may not be useful in normal circumstances, but may be useful when used with email. I left this option unchecked. Once the names were entered and the style selected, I pressed the Save Watermarked PDFs button at the bottom of the panel. Once I had selected the target destination for the files, I clicked on the Choose button and the new PDFs were saved. Each had its own unique file name and each page within the PDF was also marked with the unique identifier. The processing was a matter of seconds for the batch, and the file size was not changed from the original 17.8MB using any of the styles. When I tried a single file, the time to save this was a matter of no more than a second. We are told that the name was chosen as it was a street in Hollywood. Some of us older folks can remember Charles Bronson who made several movies, including The Mechanic. Bronson Watermarker makes a useful addition to the applications collection for its $9.99 (about 350 baht). While the use of the application is straightforward for those in need of a tight control over distribution, it has some slight limitations. It may be useful, for example, if more choices as to font, and to font size could be made available. Documents are sometimes created with a need to look good, and such a choice may make the finished product more pleasing, especially to corporate end users. Styles could also benefit from some additions. 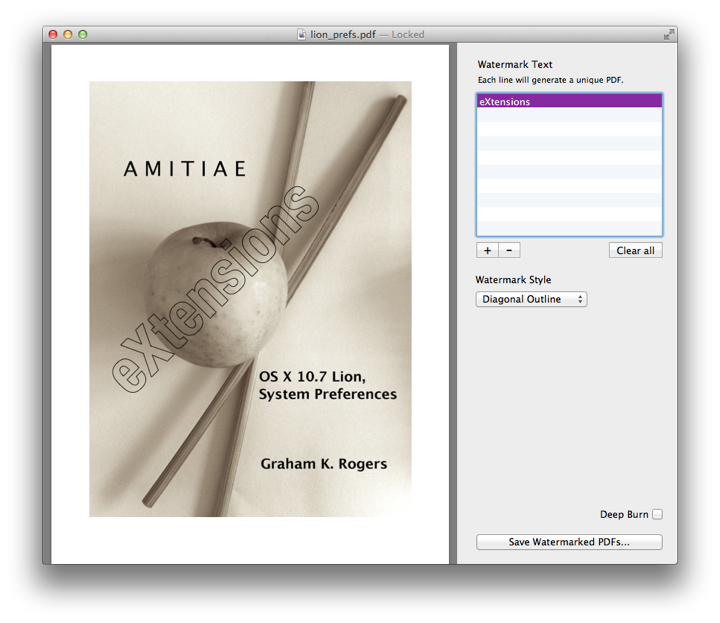 I uploaded my own watermarked file on Lion Preferences to the eXtensions site, where anyone is welcome to examine it and the Bronson watermarking.